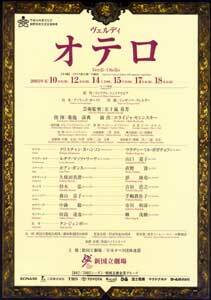 *Yamaguchi Michiko,who was originally to perform the role of Desdemona on 14th,17th is unable to perform due to her physical condition. Alternatively, Deguchi Masako is taking her place. Please refer to New National Theatre News. Doors will open 60 minutes before the opening of the performance. Small lectures on this opera will be presented 45 minutes before the curtain time. Available from Sunday 6 April, 2003 at 10:00am. This production, which was premiered by Britain's Royal Opera, Covent Garden in 1987 under the direction of Elijah Moshinsky, is highly acclaimed as a classic opera production of Otello. The forthcoming production at the NNTT will feature the double casting of Kristian Johannsson and Vladimir Bogachov in the role of Otello (they also both played Don José in the NNTT's 2002 production of Carmen), as well as Lucia Mazzaria, who has appeared at renowned opera houses in Italy and elsewhere, and the promising Japanese singer Yamaguchi Michiko for part of Desdemona. Iago, another intense character in the opera, will be sung by Juan Pons, who played Scarpia in Tosca at the NNTT in 2000, and Naono Tasuku. Both men are prominent baritones with a great presence. With a dazzling cast of singers and dramatic music woven by conductor Kikuchi Yoshinori, the curtain will rise for this tragedy conceived by Verdi and Shakespeare. The setting is the Mediterranean island of Cyprus in the late 15th century. The new governor Otello arrives after battling a stormy voyage. His ensign Iago is jealous of his colleague Cassio, who was promoted over him to the position of lieutenant. At the banquet, Iago makes Cassio so drunk that he starts a drunken brawl. Infuriated, Otello dismisses him. Iago suggests to the disappointed Cassio that he ask Desdemona to intercede with Otello on his behalf, while he adeptly plants suspicions in Otello's mind about Cassio and Desdemona by arranging for him to see the two talking from a distance. When Desdemona pleads on Cassio's behalf, Otello becomes angry from jealousy, throwing down the handkerchief she gently offers him to wipe his face. Iago successfully obtains the handkerchief and plans to have it passed into Cassio's hands. Otello, finding the handkerchief in Cassio's possession, becomes convinced of his wife's infidelity. When a group of Venetian ambassadors arrives carrying an order for Otello to return to the merchant city, Otello, believing that Desdemona is grieving from having to part from Cassio, loses his mind and insults his wife in front of the crowd. That night, Otello strangles Desdemona to death in the bedroom. Realizing soon after the truth that everything was the result of Iago's scheme, Otello is shocked and stabs himself, falling and dying beside Desdemona.